Innovative technology and digital communications have enabled us to connect like never before and when we apply the latest advances to security and monitoring at our homes, we’re talking a whole new level of convenience and information. Certainly smart is the new safe when it comes to home security and there are numerous ways of using technology to monitor our homes and keep an eye on what’s going on inside and outside of the property. CCTV surveillance cameras. When you link up your security cameras at home with the appropriate app on your smart phone or other digital device, it’s possible to see what’s going on at home in real time from anywhere in the world. Check on a sleeping baby or keep an eye on restless teenagers, identify visitors or cars in the driveway – even make sure your irrigation system is working or that the pets are OK. Built-in motion sensors in the cameras can send an alert to your phone when movement is detected and if you have a fully integrated home automation system, you can also send instructions to the system telling it to activate extra lighting or to sound a siren. Intercom systems. A smart intercom system lets you monitor your property’s access/exit point from anywhere in the world. Some smart systems work by ringing your phone when a visitor presses the intercom, and through a built-in camera on the system, you can identify them before letting them in by activating the smart door lock remotely. You can also talk to someone at the door if your smart doorbell is linked to your phone which is useful when it comes to making contact with a delivery driver etc. Smart door locks. Electronic door locks are becoming extremely popular as a convenient, fuss-free way of keeping tabs of who is coming and going from your home. Codes can be assigned to different family members (or temporary ones given to service providers like babysitters and cleaners) and you can keep tabs on who’s entered and left the property by checking the log on your smartphone or computer. You can monitor the time that they came in, when the house was locked up and so on, giving you peace of mind that your access control is being monitored 24/7. Sensor-activated controls. Fully programmable environmental monitoring systems allow you to monitor your essential services anytime, from anywhere. From power and temperature sensors to smoke detectors, humidity sensors and water sensors, it’s possible to get a status report and real-time alerts on a wide range of services and environmental conditions in and around the home. 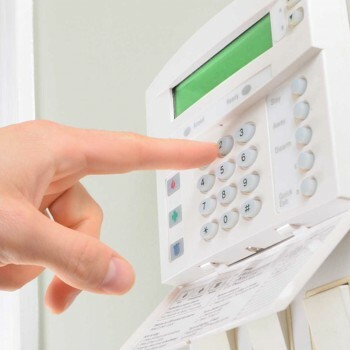 This enables you to safeguard the parts of your home that are sensitive to climate, get early warnings of freezing temperatures so as to avoid burst pipes, be alerted to power failures and security breaches etc – all of which are very smart ways of making sure that your home is protected 24/7. Voice-controlled assistants and smart-home hubs. Devices like Google Home and Alexa (Amazon’s cloud-based voice service) let you interact with technology and verbally control your compatible internet-connected smart home devices such as lights, plugs, appliances and more. Whilst each of these are smart ways of monitoring your home, your best bet for keeping tabs on what’s happening at home any time of the day or night is with an integrated, reliable and flexible home security system. A smart security system will incorporate many of the individual aspects like sensor-activated controls, smart locks and door bells and wireless CCTV surveillance cameras in an integrated whole, and will be able to connect to your smartphone, your computer and any other digital device. You’ll have peace-of-mind that your home is protected 24/7 and you’ll be able to check on all the elements of your integrated system, such as your power supply, lighting, door locks, perimeter security etc whenever you want – and in real time. You can find out more about the different smart tech products available for your home by getting in touch with Crown Security. They’ve drawn on their decades of experience in commercial security to establish themselves as a leader in the field of home automation, integration and smart home security in Perth and they offer a wide range of high-value, affordable residential solutions including wireless security cameras, home alarm systems, home access control, intercom systems and more. Contact them on 08 9400 6000 for an obligation-free chat with one of their industry experts or visit www.crownsecurity.com.au to see their full range of products and services.